Almost 2.5 billion people use social media online today and you can now do so much more than just promote a product on social media, you can sell it. Almost 2.5 billion people use social media online today and you can now do so much more than just promote a product on social media, you can sell it. Social selling is when a business uses social media to directly sell their goods. It’s the latest way to develop meaningful relationships with potential customers by connecting with them. 67% of the customer buying journey is digital. Decision makers read 5 or more pieces of content online before making a purchase. Therefore selling on social media gives eCommerce businesses the ability to make any social media post shoppable. It’s quite simply using online social tools to engage in the relationship-building strategies that have always been the foundation of what good sales professionals do. It gives you the chance to be involved in the purchasing decision. On the other hand, selling on social media is not about bombarding strangers or followers with unsolicited Tweets and private messages. This is spamming. You need to nurture and build your relationship with followers, posting the best most informative content about your products to the right audience at the right time. Studies show that over 50% of people shop on their phones and the majority of these people use social media. So by not participating in social selling you are most likely losing out in revenue. We have put together some best practice suggestions to keep in mind when considering social selling. Start off by choosing a theme. Each of your social networks provides a unique outlet to your audience. The way you use and run your social media gives viewers insight into what to expect out of you and your page so it’s a good idea to have a theme or tone of voice. This also keeps you consistent with your brand message and image. Grow your audience the right way. Big numbers are great but what you really want is an engaged and loyal audience. The best formula to steadily grow your customer base is to be consistent while sharing valuable content, sending timely responses, and being helpful and friendly to your users. Share behind the scenes content. 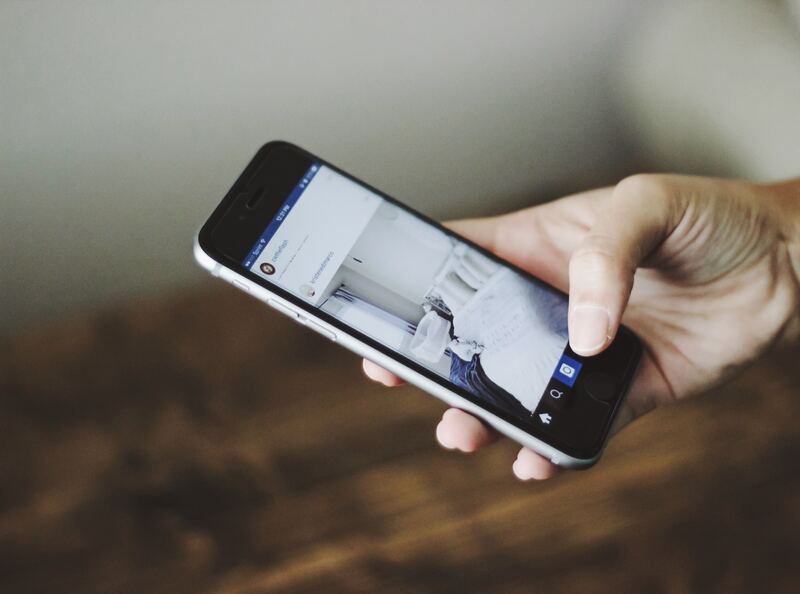 One platform that’s great for brands to show behind the scenes of their company is Instagram. Not just through posts but through Instagram stories. Though the stories format is very similar to that of Snapchat stories, the good thing about Instagram stories is that anyone can view your story, even if they’re not following you, as long as your page isn’t on the private setting. Stories are the ideal tool to show your audience a more raw and authentic real-time look into what sets you apart and what makes your business unique. One of the most important things you need to ensure you are doing is producing good quality images and videos. If your images are blurry or not clear they won’t generate the attention. Captions are also a great way to engage your users because you ask them questions and spark conversation in the comments. For instance, you may be releasing a new product in multiple colours, you could ask users “which is your favourite”. Another great tactic is to have specific goals and get to know your customer. Who are they? What are their interests, likes or dislikes? Can your product meet their needs? It’s important to ask yourself specific questions about your buyers in order to target them more effectively. By moving away from basic-level targeting, you spend more time reaching out to the individuals that matter. This way you can relate to them in a way that can potentially result in closing a sale. If you really want to ramp up your social media selling then look to take advantage of UGC (user-generated content). We’ve spoken a lot about user-generated content and the importance of reviews in our other articles, you can read more here. It is great practise to encourage your staff to be social ambassadors by making it easy for them to share company content on their personal channels such as LinkedIn and twitter. Employee engagement is one of the best ways to get your social message spread far and wide. Sales don’t often occur on the first contact, 80% happen on the fifth to twelfth contact but almost half of businesses do not follow up after the first contact. So to win the sale, it’s important to have a follow-up process. The best sales come from relationships that have been built over time. Active and consistent engagement is an important part of any social campaign. Different ways you can engage on social media include reaching out to your followers, being involved in online conversations and trying to solve any problems left in the comments section. Joining relevant groups and taking part in niche discussions by offering unique perspectives or ideas. Or positioning employees on social as industry experts who share diverse, relevant content can all help you to sell more and grow your online presence. You will only start to sell more online on social media if you build trusted relationships and nurture them. You want to offer value to prospects first, and sell products second. The priority needs to be the customer and then the sale will follow. The sales you get should be a by-product of the care and attention you give to your customers. Brands and employees can establish this trust to build stronger relationships include connecting to prospective buyers on a more personal level, other than just automated messages (a little extra effort can go a long way) or content and starting conversations around topics related to your industry as a whole. E.g. fashion related conversations. Finally, incorporate social influencer marketing. Influencers are people who are active on social media and blogs and have a large following. They are also brand advocates and promote products. Once upon a time, brands paid big named celebrities to promote their stuff, but today it’s social media influencers that brands often go-to. This is because they’re more accessible and more affordable than celebrities yet they still having a large following, often hundreds of thousands. Once you have identified your audience, it’s time to start choosing and using influencers to social sell. Why engage with an influencer? Consumers trust recommendations from a third party more often than the brand itself. After all, the brand will try their best to make their product sound as good as possible. When you social sell via an influencer, not only do they bring their audience, but they also bring their audience’s network as well. Due to the loyal following they have, an influencer has the ability to drive interest and traffic to your site, increase your social media exposure, while also helping sell your product through their recommendation. 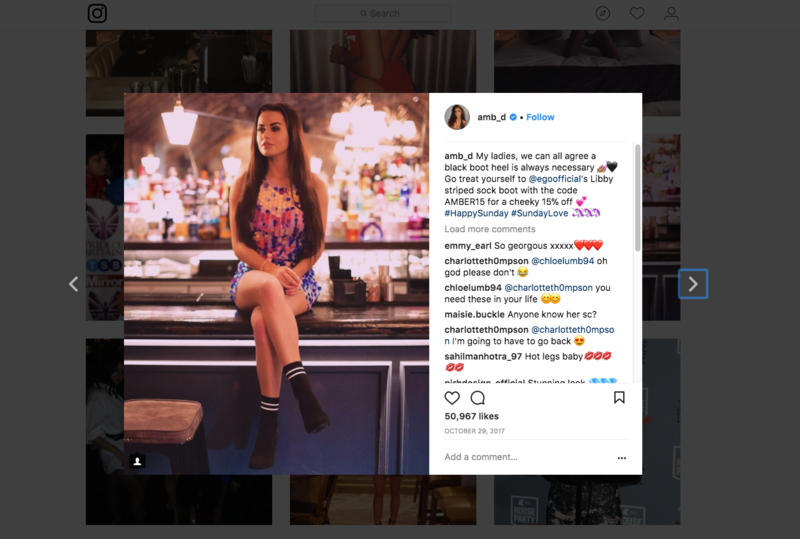 In this example, we see the brand Ego Official, a footwear brand, and Amber Davies, a reality star with 1.6 million Instagram followers. The caption is engaging and involves her audience into her thoughts (a topic for possible discussion) and in this case, she’s even given her audience an exclusive discount code. This would have been given to her by the brand to further entice Amber’s followers to make a purchase. 95% of westerners now own a mobile phone and 2.5 billion people use social media. With statistics like that, not choosing to participate in social selling would be a hugely missed opportunity. Social sellers attract 45% more opportunities than their peers. They are also 51% more likely to achieve quotas and outsell than those that choose not to social sell. 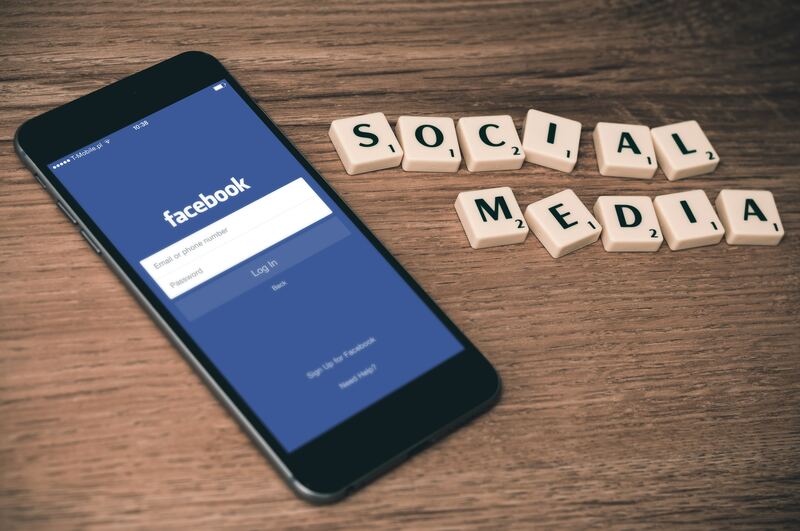 Getting your foot in the door by making sure you have all the relevant social media accounts to sell and promote your products, such as twitter, facebook, and Instagram, is a good start. eCommerce stats show 74% of consumers rely on social media to guide their purchases, and 43% of consumers are more likely to buy a new product when learning about it on social media. If your sales team has not embraced social selling, your sales are quite simply not what they could be. If you've enjoyed reading this article and would like to discuss your next project in more detail with us please Contact Us or give us a call on 01233 800 991.